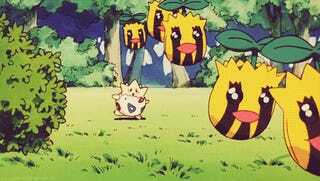 Synthesizing Sunkern! Pokemon One a Day, Series 2! What the?! I thought we was done with whack grass type weakasuarus rexes! Looks like Aipom was only there to provide a small breath of fresh air as we move towards Sunkern! 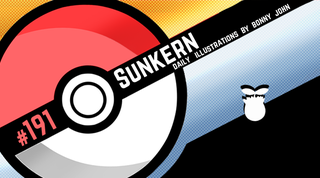 Oh well, at least Sunkern is sorta cute. Today we mesh our world with a cartoony subject - can you spot all the little Sunkern scattered about? I actually always wanted to do a piece like this for series 1. Find a way to put a cartoon into photograph in a sort of seamless way. Not sure how seamless Sunkern appear here, but I did my best to have them lit up according to the light source in the picture. I obviously chose a picture I thought would be a great environment to place them in; a garden of sorts. I used Google and used their search tools to find a picture that was okay to modify, so don't worry about that element of it. The picture obviously does all the heavy lifting, and my work was minimal but the two combined create a lovely little scene I hope you'll enjoy! Streak's alive at 40 straight illustrations. Guess I'll celebrate in two weeks if I can do 50 straight...But it'd be a short one as the realization that another 50 waits would kick in. Comments, critiques, concerns...Post em if you got em!